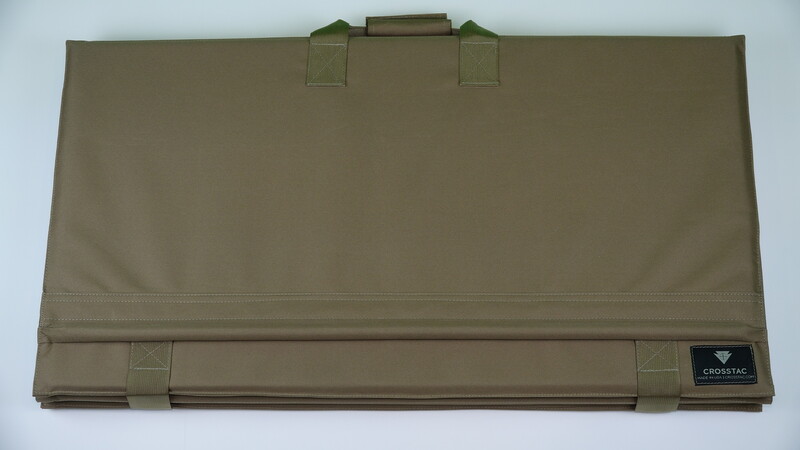 Your shooting mat should give you a more precision shooting experience. Period. At Crosstac, we’ve come up with the most well thought out shooting mat on the planet… from its sturdy “first in the industry” bipod rail to its superior 100% USA built construction and materials (right down to the thread we use), our mat will help you be more accurate on any terrain. *Currently in use by multiple units across our military, homeland security, and border patrol agencies. Used at the 2013 FTR World Championship matches, helping the USA FTR Shooting Team to win their second Championship. CROSSTAC is now a proud sponsor of the USA FTR Shooting Team and excited to help outfit them in their quest for a third consecutive World Championship in 2017! Unlike roll up mats with edges that constantly curl up when you deploy, our mat folds, unfolds and deploys flat instantly. It also stores flat… nicely sliding behind the seat of pickup, in your closet, on a shelf, etc. Superior quality foam rated to -75F so it won’t crack, plus it’s the perfect thickness & density for both comfort and stability. Perhaps the best feature: our unique, heavy duty bipod rail system will help give you more precision every time you squeeze off a round.